← BRIK AUDIO forum style review from downunder – Part Four. Although the Italian audio company Audia has been in business since the last century, it took till 2011 that I had the opportunity to listen to one of their class A power amps, the Audia Flight 50. It was just what I was looking for at the time and I bought one to use in my main system. 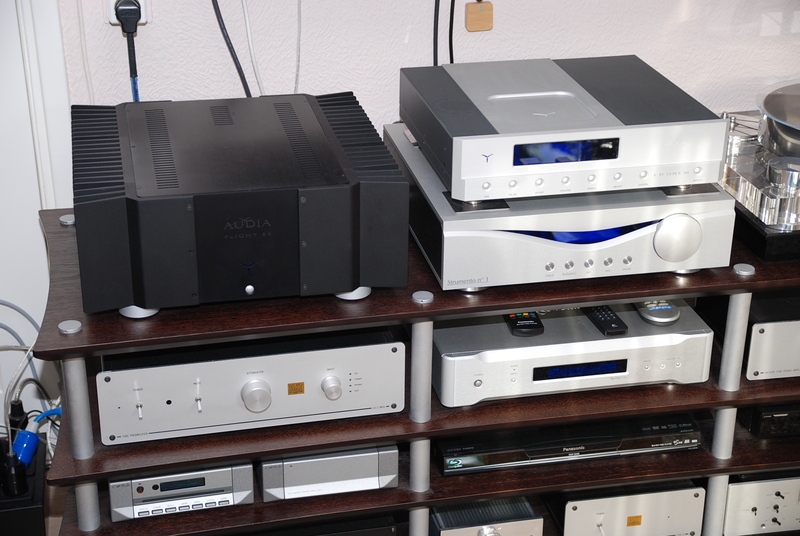 This year (2012) I met the Audia guys on the High End Show in Munich to take a look at their top range named Strumento, consisting of just one power amp and a separate preamplifier. With a little help of the Benelux distributor Durob we soon agreed to review the pair. Unfortunately I live in an apartment on the third floor, without an elevator, and to bring up a 90 kilo Strumento Nr.4 over seven stairs promised a mission impossible. We therefore agreed to use my own Flight 50 in combination with the Strumento N° 1 preamp, with additional an Audia Flight CD One M player and some Yter balanced interlinks. Unfamiliar with Audia preamps and very happy with my own beloved tube line stage, I was in for a surprise as soon as I switched on the Strumento. The Strumento series from Audia consists of just these two products, a pre- and a power amplifier. The N° 1 is a sculpture in two colors aluminum and has the unusual size of 45 cm wide, 45 cm deep and 12 cm height. With a weight of 28 kilos. Only five buttons are to be found on the front together with a large (multifunctional) volume control. A dimmable display shows the menu options, the chosen input or the volume setting. Turned off, a blue LED will light up the listening room. The back side is far more crowded with all its inputs and outputs. The first two inputs are configurable for either XLR (balanced) connection or RCA (unbalanced) use. Three additional inputs are XLR only. A RCA tape-out is provided. The signal output consists of a single pair RCA’s as well as two sets of balanced XLR’s. This leaves only the mains power input, the mains switch and RJ connectors to communicate with other Audia devices. What is inside the box remains a bit of a secret. I know the preamp has a power supply with 60.000 uF buffer capacity, which is more than a lot of power amplifiers have on board. A total of eight power circuits are used. Special audio transformers, copper bars, print boards with extra copper and ultra-fast rectifiers are inside. The volume control is setup with resistors and relays, to make sure the signal path is short, even more important the output impedance of the volume control always has the same value. Relay clicking is audible when changing the volume, but only mechanical and never through the loudspeakers. The amplifier circuit is fully balanced from input to output, with reasonable chosen gain (-90/+10 dB) to be able to use very different power amps. Input switching is also by relay of course. After a couple of hours use the complete chassis warms up, more than any other preamp I know that has no tubes inside. No wonder since the Strumento is using a maximum of 50 Watt from your mains. Some additional information, like a bandwidth over 1,5MHz, a gain resolution of 0.5 dB, frequency response is (-3dB) 1 Hz up to 1 MHz and S/N Ratio of 105 dB. The input impedance is 10pF over 15 kOhm balanced or unbalanced, the output impedance is only 5 Ohm. It took a short moment to configure the inputs for RCA, set the balance to zero-zero, etcetera. Input gain setting is possible in case one or more sources sound either too soft or to loud. The Strumento N° 1 replaced my hand build tube preamp and formed a combination with the Audia Flight 50 over Yter balanced interlinks. The preamp is powered through Kemp Elektroniks filters. Besides a Magnum Dynalab tuner three different sources where available. The Audia Flight CD One M as a stand-alone player, or digitally connected to a NAS with the use a Logitech Touch digital output. The second source uses the same NAS and Touch, now connected to an Esoteric D-07 D/A converter. In both cases a second pair of Yter cables is brought in. Last but not least a Transrotor record player with SME5009 arm and Transfiguration Axia cartridge spins records, connected to a hand build, tube based, phono preamp. The loudspeakers are a pair of PMC fact.8 transmission lines, wired by Crystal Cable speaker cable. I am very familiar with this system, which is in daily use. Any amplifier needs time to warm up, so do both the Audia’s, before serious listening starts and maximum performance is reached. Since I wanted to hear what the Strumento does, I used my Esoteric first. It hit me hard as soon as music played. After two weeks I am still not used to the incredible upgrade the Strumento N° 1 is capable of in my system. It is just three weeks ago I told some friends I would never get rid of my tube preamp, now all I want is the Strumento. First of all, no matter what kind of music I play, the impression is always the same. Which means in any music even the smallest details are presented with ease. Not in a technical or clinical way, they are part of the music that flows into the listening room. This flowing is neither romantic, colored nor laid back. It is fast, to the point, pure and natural. Voices and midrange are spread out wide, in the correct proportions. No singer has a mouth like a crocodile or compares to a mouse. Tonally I could not wish for more neutrality. The volume control does not affect the sound, loud or even extremely soft, your attention is always attracted to the music. A FLAC rip of the Blu-ray of Adele Live At The Royal Albert Hall brought tears to my eyes as soon as the audience joins her singing. It was amazingly easy to beam myself into the public and join them. To time travel to the London hall. A Chinese singer with the name of Luo HaiYing, singing in her own language on Supernatural Yala, has musicians behind her with traditional Chinese instruments. The impact of the large drums is immense. The rumbling was never clearer with each strike apart from the previous or next one. Bass is one of the strengths of the Strumento N° 1. It goes very, very deep, well detailed and with impact. It will not overblow or drive your neighbors into madness. It is just there, solid enough to get air into motion. A plucked bass is presented with ease, bass drum hits you in the stomach, fast and powerful. The higher tones won’t upset you in any way. They are light in tone, like the triangle that is present on Legende by Giovanni Angeleri, the (SA)CD contains some of the most famous pieces for violin and orchestra by Sarasate, Paganini, Bazzini and Wieniawski. Or like in the tambourine, with every bell separated from the other. This is by far the best presentation of detail, speed and musicality combined, compared to any other preamp that ever made it into my system. Did I mention the soundstage the Strumento is able to recreate? Just close your eyes and you will never be able to pinpoint the loudspeakers. The stereo stage is width, deep and has enough height. Recreating depth is not that easy in my room, the Strumento simply overrules physics and makes a habit of fooling your brains. The smooth operation of the top loader door on the CD One M CD player is a delight to be seen. Like everything else in the Audia products it is pure luxury and made for life. Compared to the Esoteric D/A converter, the Audia Flight CD One M sounds just different used as a DAC over S/PDIF. Not better, not worse. It has a bit more speed and better timing, on the other hand the sound is a little more upfront. These differences are highlighted because I upsample the digital information in the Esoteric to DSD format before decoding. While the CD One M sticks with PCM encoding. As a stand-alone player it sounds a bit more shut in, a little more precise and lacking the small additional hardness streaming always seems to suffer from. There is no denying the family relations between Audia products. The CD player, the preamp and the power amplifier reinforce each other’s properties. This was heard with the pre-power, even more when the CD player is added. Although the Flight 50 is not an amplifier with a balanced circuit, it does have XLR inputs. Comparing XLR to RCA shows all benefits that XLR brings, from DAC or player all the way into the power amp, over RCA. The Yter cables seem a match made in heaven as well. So, what we have is a chain bringing out the best digital sound in my system up till now due to the Strumento N° 1. What is left as a source is the record player, waiting for the grand finale. I lowered the Axia diamond into the groove of the Eva Cassidy record Songbird and that was it. My mouth fell open, stayed open all the way, till side one came to an end. All good properties suddenly shine even more. Playing a record can only be compared to listening to studio masters in high sampling rates. This Strumento N° 1 is an open window to the music for every detail available in the recording. It just flows and flows. I could listen for hours and hours without any stress or getting tired. I invited some friends over on several evenings, the three of them well known for golden ears, used to deal with high end equipment and often to be found on life performances, either for jazz of classical music. Just to make sure my ears and mind did not betray me. The one who only loves tubes admitted this was a solid state setup comparable with only the best tube amps. Another one got (almost) permanent goose bumps. Number three stated that this Strumento N° 1 was by far the best preamp he ever heard. In my humble opinion they are completely right. This Strumento N° 1 is amazing. It is useless to repeat all the compliments made above. To repeat how well each Audia component blends with the other. CD player, preamplifier and power amplifier. It should be enough to state that I am going to buy the Audia Strumento N° 1, although it will cost me 12.000 Euro’s. I have reviewed even more expensive stuff, of course also a lot of more cheaper audio, this Strumento N° 1 comes into my small list of most wanted products. On this list among others are a Manley Steelhead phono amplifier, Esoteric SACD separates, a Soundsmith Strain Gauge cartridge and the Blumenhofer Wiki speaker system. To get the money for this Italian beauty I have three options: sell my wife to the highest bidder, sell my car or sell my second audio system. I made my choice, anyone for second hand audio equipment? Because I want that Strumento N° 1. Later on I might need even more cash, as soon as we figure out how to get the Audia Strumento No.4 upstairs. If you are in the market for a special preamp, drop in with your dealer and ask him to play a little music through this device. If the setting is right it might just as well grab your attention as it did mine. Enjoy the disappearance of any loudspeaker in use. Music or singing is just there, existing in front of you. Don’t open your eyes to lose the magic, all you have to do is enjoy the true high fidelity reproduction of whatever is on your records and CD’s. Dit bericht werd geplaatst in Audia Flight, Rene van Es, Reviews - Tests en getagged met audio, audio flight, electronics, herman van den dungen, hifi. Maak dit favoriet permalink.